Car insurance makes up for your loss, so it doesn't boost your income. 1. Can You Write Off Your Homeowners Insurance Deductible on a Claim? 3. Are Homeowner's Insurance Loss Payouts Taxable? If you've just seen your car totaled, it may be some small comfort to know your insurance check isn't going to add to your taxes. Health, homeowners and car insurance payouts aren't income. Instead, tax law treats them as compensation for the loss of property or reimbursement for repairs and medical bills. Say you spend $350 on repairs after which your insurer cuts you a check for the expense, less your deductible. You have no taxable income, and don't report the check on your 1040. If the check is more than the value of your repairs or your car, the excess money is taxable. Auto insurers, though, almost never pay more than the car is worth, so you generally don't have to worry about this. If you suffer a financial loss from a car accident, it may be deductible. For example, if your classic T-bird gets totaled, you can claim the loss as a tax write-off, provided the destruction wasn't your fault. 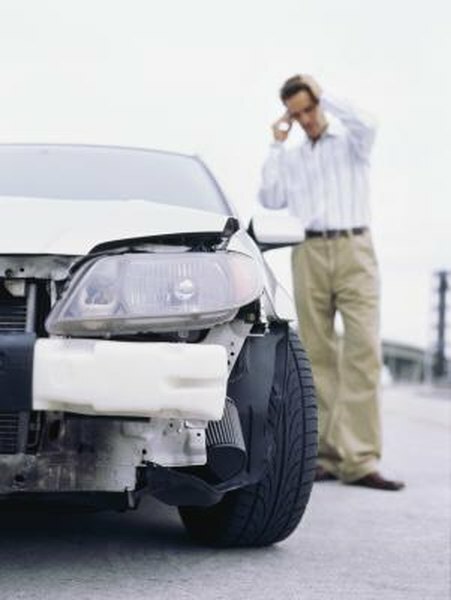 Insurance on the damage still isn't taxable income, but it does reduce the write-off. If you can claim a $5,000 loss on your car, for instance, but insurance pays $3,000, all you get to deduct is $2,000. If, say, a steamroller crushes your car in 2013, you report the loss, less your reimbursement, on your taxes for 2013. If your insurer doesn't pay up until 2014, you claim your loss based on the payment you expect to get. If it turns out in 2014 that your numbers were off, you handle that on your 2014 taxes. For example, if your expected $10,000 but your insurer doesn't pay anything, that's a $10,000 loss you can write off. If you think a bigger casualty tax write-off would be worth more than getting cash for your car, too bad. The IRS states specifically that if you don't file a claim, you still can't deduct a loss that would have been covered by insurance. That also applies if you screw up and miss any company deadlines for filing a claim. However if you had, say, a $5,000 loss and your insurance would only have covered $4,000, the remaining $1,000 is still deductible. Nasdaq: Is My Car Insurance Settlement Taxable? Insure.com: Are Insurance Settlements Taxable?